(l-r) Lara Spencer, Zandra Cunningham and Tory Spencer on ABC’s ‘Good Morning America on March 1, 2018. 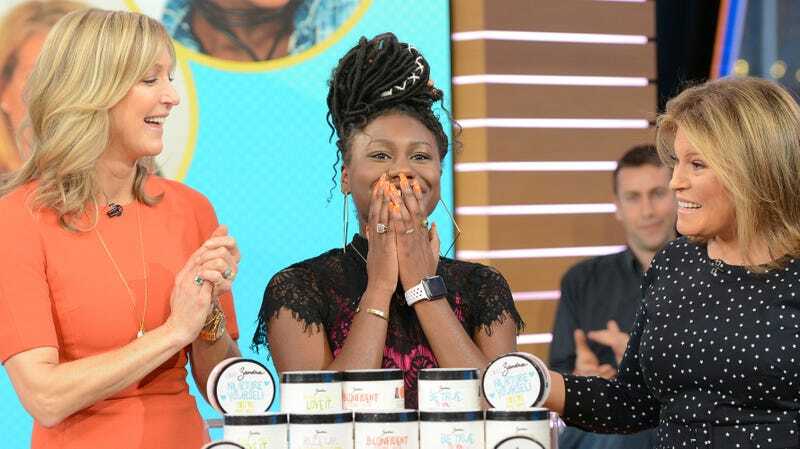 There’s a fresh face in the beauty business—and she just scored a big win! Black News reports that Zandra Cunningham, one of our 2018 Young Futurists, just landed a partnership with Target to take her eponymous plant-based line to the next level! The big box retailer is giving coveted shelf space to an exclusive Zandra Beauty gift box, which will include one each of her nourishing hand & body lotion, exfoliating sugar scrub, and acclaimed lip and body balm. “I am so excited to offer my unique brand of American made yuck free products in an exclusive gift box designed specifically for Target,” Cunningham said in a statement. A tremendous feat for an entrepreneur of any age, landing in Target is the result of half a lifetime’s effort for Cunningham, who launched her brand at the ripe old age of 9, fueled by a desire to wear lip balm. Her current line of 50 plant-based skincare products began as a handful of chemical-free offerings at local farmer’s markets in her hometown of Buffalo, N.Y. Now, the teenage CEO is not only making gains for herself, but fostering empowerment for girls and women via STEAM and entrepreneurial education. Fans of the brand can become Zandra Beauty affiliates.